Documentary has become the field where, as the New York Times recently put it, “all the cool kids are.” Documentary filmmakers have more opportunities than ever before, from independent docs, viral videos, and doc-style TV series, to VICE on HBO and other documentary programming on cable TV networks. 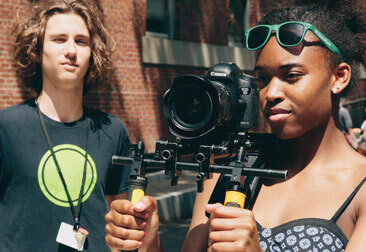 The 3-Week Documentary Camp for teens is an intensive program that combines in-class instruction and hands-on production where students put into practice what they learn in the classroom. During the three weeks, students learn the basic tools of documentary filmmaking. They take classes in Producing and Directing, Camera and Lighting, Production Sound, and Editing, then apply what they learned by creating a two-minute individual observational film, a three-minute interview project, and a short group project under the guidance of their instructors. Following the production and post-production of each project, students screen their work with their classmates and instructors and engage in positive critiques and discussion. • Producing & Directing: This class is the core of the 3-Week Documentary Camp and establishes a foundation for all projects. Through lectures and screenings, students explore documentary techniques, genres, and styles including traditional and hybrid documentary and reality TV. They learn to develop an idea from concept through post-production as they produce and direct nonfiction projects. • Camera & Lighting: In Camera & Lighting, students master basic camera and lighting skills in the digital video format, touching on technical details such as aperture, shutter speed, focus, frame rates, white balance, video latitude, gels, and filters. In hands-on lighting sessions, students learn to work with and enhance available and natural light situations, as well as traditional lighting for interviews and controlled situations. • Production Sound: Sound provides hands-on training with recording sync and non-sync sound using basic and most commonly used digital equipment. It emphasizes the importance of recording usable location sound for a smooth transition into post-production. • Editing: Documentary films often find their true forms in the editing room. This class makes the editing process extremely important because a story may take a different shape after the footage is reviewed. Want to learn more about this filmmaking camp? Click here to learn more about the application process. Please note that curriculum, dates, and prices are subject to change.